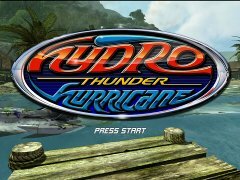 Way back in the Summer of Arcade, we got a chance to play the excellent revival of a classic boat racing arcade game, Hydro Thunder Hurricane. 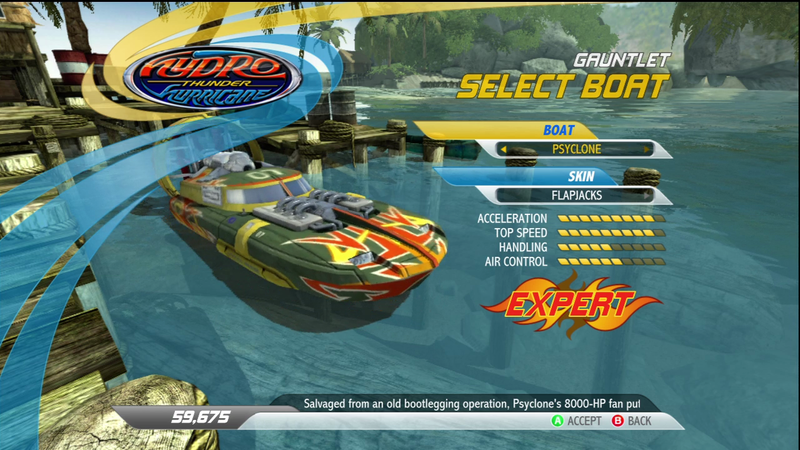 Now Vector Unit has given us the keys to a few new boats and a few new tracks in their new Tempest Pack DLC. Is it worth the sticker price? Let’s take a look see. 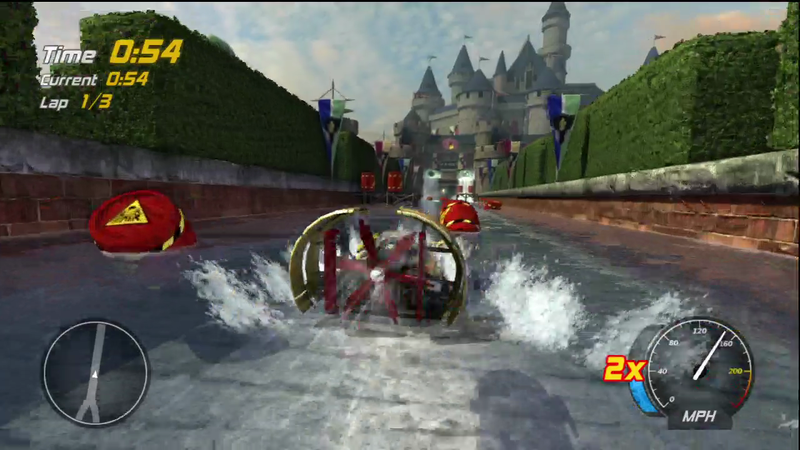 As is generally the case with a DLC, the graphics of the Tempest Pack are the same as the original game, only more so. Boats have gotten a few new paint jobs, including some crafted by winners of a skin design contest. This is neat and all, and a nice value add, but the real meat of the DLC comes in the new boats, and the new levels. The new boats are just as unique as any that came with the original set. My favorite is a swamp-style fan boat. 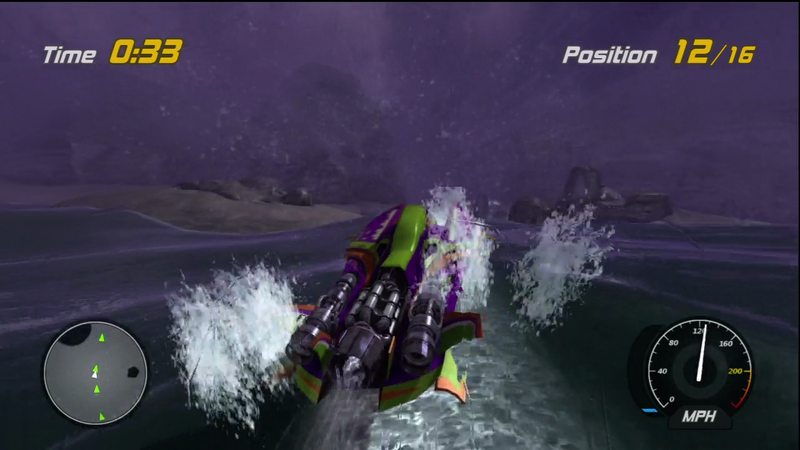 Call me crazy, but I love the idea of zipping across the open seas in a rocket-powered bayou-buggy. What I found to be most worthwhile, visually, was the trio of new levels. The first is Atlantis. 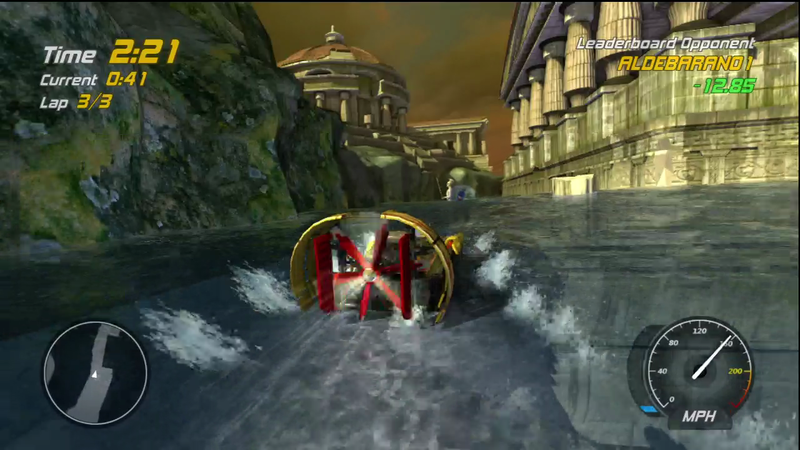 This is a curious choice for a boat racing game, what with the city being most notable for not being on the surface anymore, but once you’ve made the first of three laps, you’ll understand what they were going for. 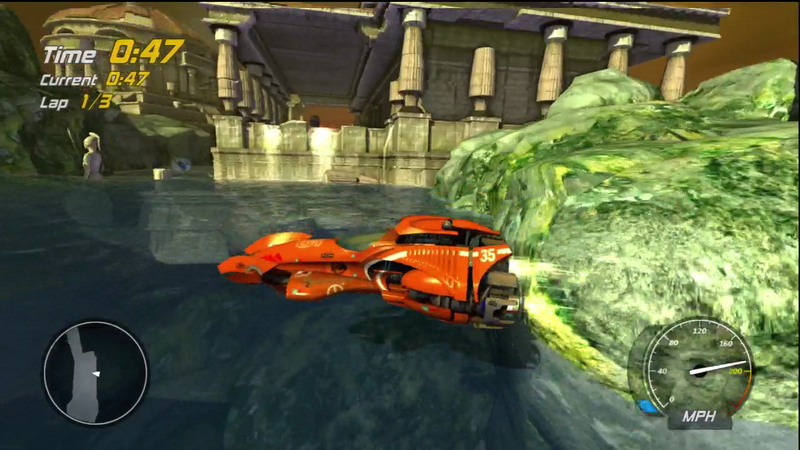 You, the racer, are lucky enough to be visiting the city on the very day it has decided to finish sinking. Greek architecture juts from angry seas, and a volcano spews molten rock down to blast mountainsides open and raise and lower structures. Next is Castle Von Boom. This track rolls us forward from ancient Greece to Medieval Europe. There are a few unique aspects to the level that we’ll go over in gameplay. With respect to pure visuals? This one isn’t anything special. My favorite level of the bunch is the Bermuda Triangle. This is the only level that takes you out onto the ocean, and it really gives you a whole new sense of scope. The waves are enormous, and once you are out among them there is virtually nothing in the way of landmarks, providing a very authentic and effect “lost at sea” feeling. Before long you start to get into the supernatural aspect, as a violent storm stirs up a whirl pool large enough to swallow an off-shore drilling platform. 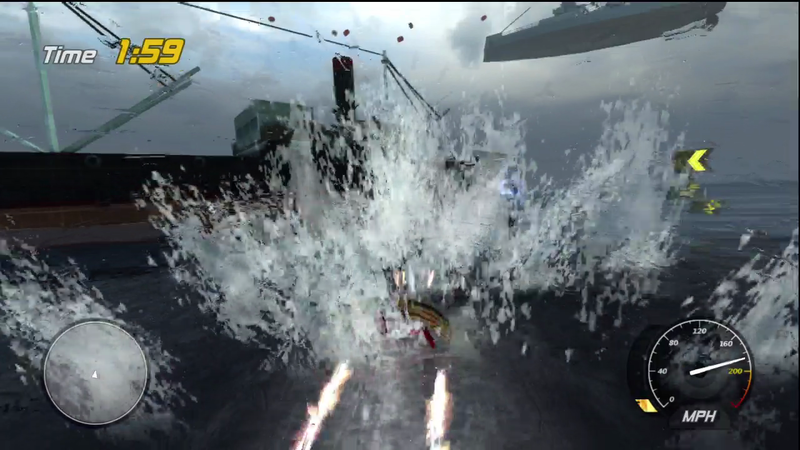 You then take a quick jaunt through a physics defying mystery zone, and end with a sprint across the open sea again, this time with whole tankers and aircraft carriers falling from the sky. From beginning to end, it super-sizes every aspect of the game. Good show. 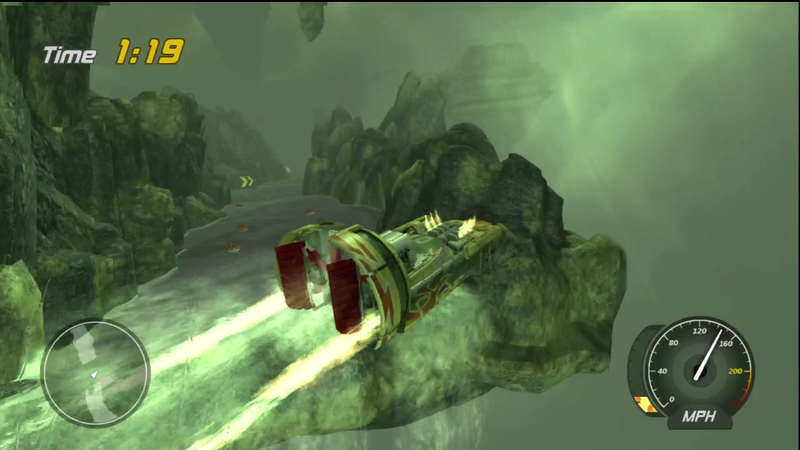 Each of the new levels has a slightly different flavor, in terms of gameplay. 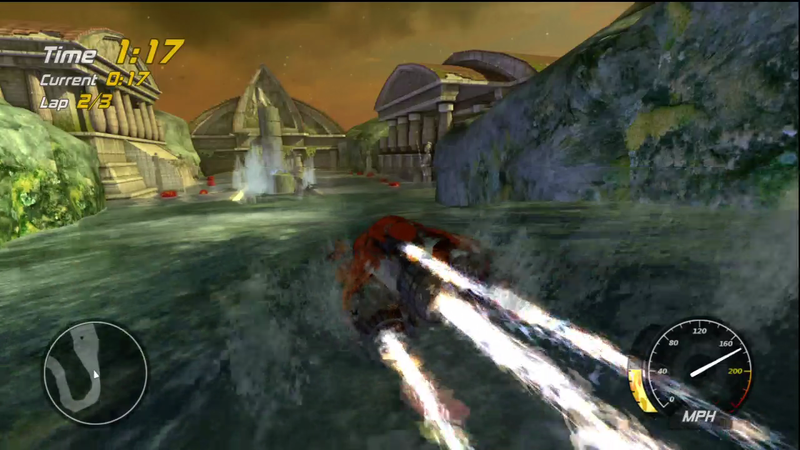 The first, Atlantis, is one of the standard multi-lap levels, changing and evolving as you progress. There really isn’t anything about this one that makes it stand out, gameplay-wise. If you were a fan of the levels that came with the original game, this is another. The Castle Von Boom is unique in two ways. Like Atlantis, it is a multi-lap level. 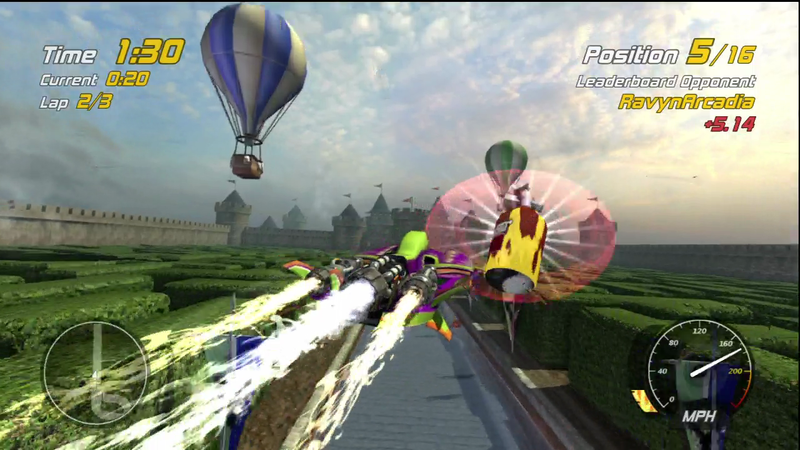 Unlike any of the other levels, though, Castle Von Boom is a which way course. The first half of each lap streaks toward a tight turn, at which point you pull a 180 and retrace the track in the other direction. As a result, you’ll find yourself in a head-on collision course with other boats constantly. The turn around isn’t flawless. 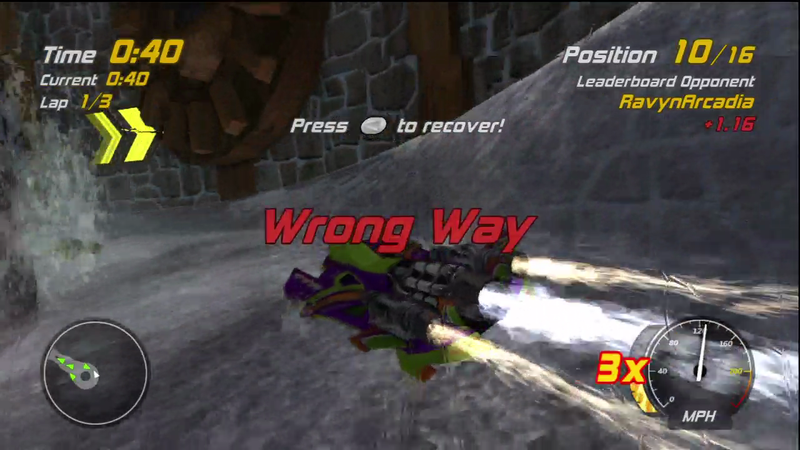 In my initial run-through the game had a habit of telling me that I was going the wrong way for a while if I took the turn too sharp, but it always straightened itself out without trouble, so no harm no foul. The other major difference is the sheer quantity of explosives. The level seems to START as the barrel-ridden gauntlet course. Once you actually play it as a gauntlet, it is wall to wall explosive. Again, while Bermuda Triangle is a whole different beast. 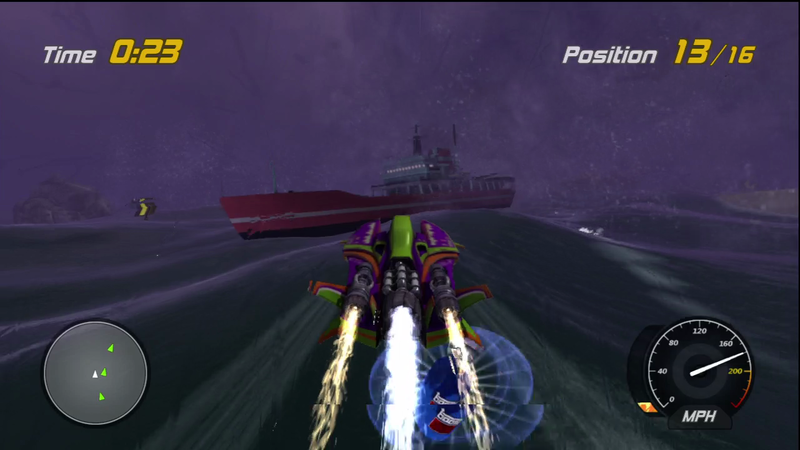 Though it shares a structure with the Area 51 level of the original batch, the open sea sections are unlike anything else that stands out in the original game. The waves are absolutely enormous even before Mother Nature starts pitching supertankers around, and the open sea section makes you feel tiny and lost, which given the setting, is absolutely perfect. The new boats are par for the course, slightly re-balanced stats and visual makeovers. One nice addition is the Expert version of the non-expert boats, which means that you can play the highest stakes races with the boats you’d become comfortable with while you were working your way up the ranks. The structure of the game means that three new levels nets you three new races, three new gauntlets, nine new ring races, and a few new championships. Add to that the fact that the new boats and levels need to be unlocked just as the old ones did (if you didn’t play the game enough to net the 200,000 credits necessary) and you’ve got a DLC that doesn’t just guarantee you’ll get a few more hours of gameplay, it FORCES you to. There were no notable editions to the audio. Same decent music, same repetitive announcer. Likewise, you’re given no new motivation to be tearing up the seas at breakneck speed. The thrill of victory will have to be reason enough. 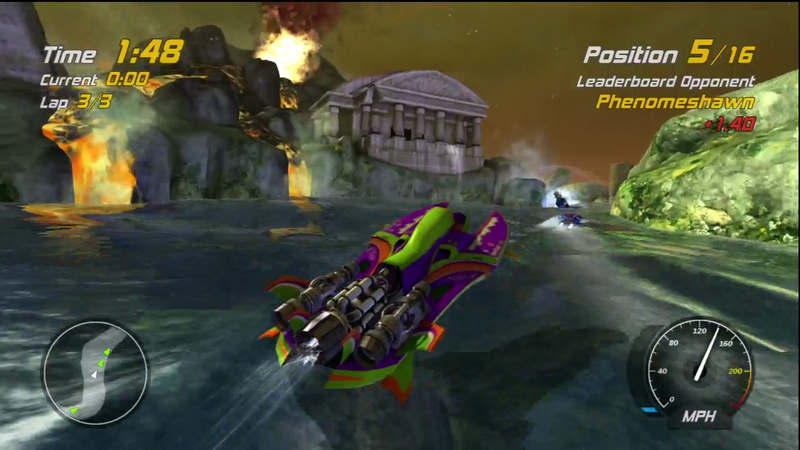 Hydro Thunder Hurricane is an excellent racer. If you enjoyed it, picking up the DLC will give you three more levels, a bunch of new boats, and some fancy paint jobs besides. The new levels give some legitimately new experiences, and if you’ve been playing in the meantime, the fact things need to be unlocked to be used won’t matter in the slightest, since you’ll already have plenty of credits. Thumbs up. 8.1 / 10. The new boats and intense new tracks make this DLC a good value for the price.